This is the last report from our local beaches for this season until. It was certainly one of the best years in the last 6 due to early low river levels. 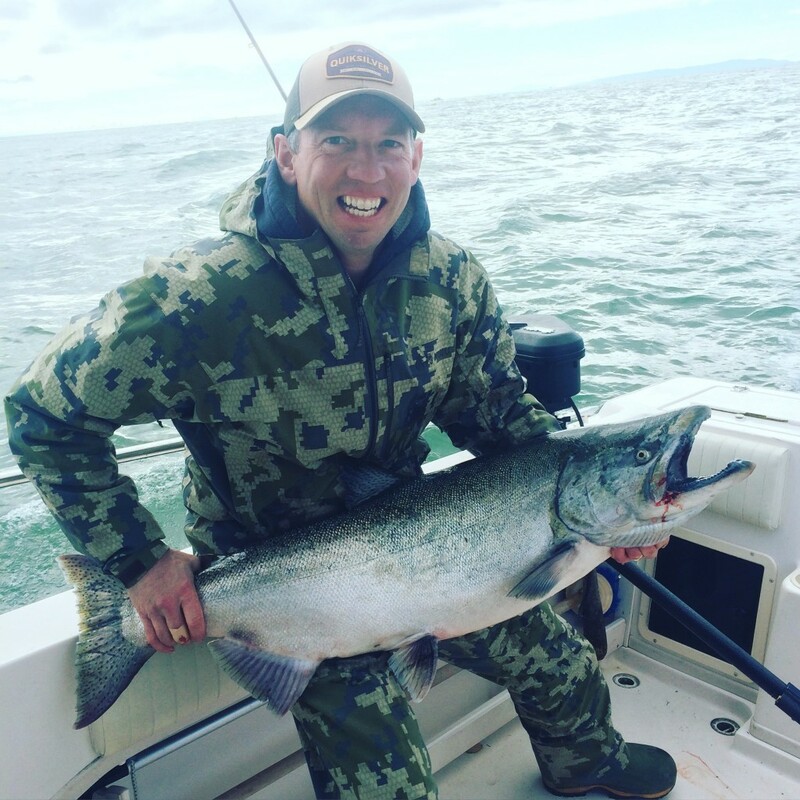 Many fisherman, myself included, caught more coho and pinks than any other year and our guided trips went really well with clients catching their first salmon off the beach. 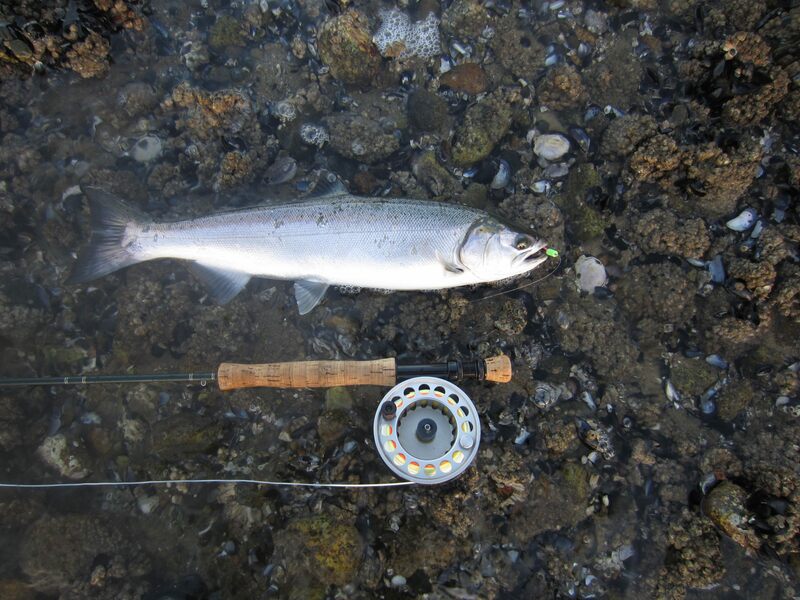 Another coho on an “AS POPPER” of Ambleside beach. I went out last Wednesday after the heavy rain on Sunday not expecting to see any fish but I found a couple of pods in the calm glassy surface, the fish were barely fining but I could see the wake they created as they swam by. I hooked one on my “AS POPPER” as the fish leaped over the fly as soon as it hit the water and that was it for the day. So if you head out you have to be really looking for any sign of disturbance on the surface and make an accurate cast in front of the moving fish, if you cast in the pod you will spook them so fishing now truly tests you sight fishing ability and your cast. As is typical this time of the year the weather and the fishing are mixed. We’ve had rainy days where we’re grinding for a fish or 2 or the warm sunny days with absolutely outstanding fishing! Sometimes the other way around too, so don’t limit yourself to those sunny weather days. For the most part every area from local to down south and everywhere in between will produce fish. Some places better than others on any given day. Starting from the South arm, the fishing had been really good earlier this week but slower on Wednesday. I’d heard that killer whales made a visit Tuesday afternoon, which would explain why they were not in the mood the next day. T10, Middle arm, North arm and Bell Buoy have been spotty as waves of fish pass thru. On any given day it can be hit or miss for a mega bite but you can usually get to take something home for the barbecue. Smiles from all on board! In past years the mouth of the Capilano is often red hot this time of the year. The tides for this fishery have been pretty good but it has been slower fishing so far. We had been hooking fish there but with the rains last weekend the level of the river rose and I’m sure some fish got past us. As in past years there’s usually another push of fish after that occurs and the fishing can really turn on as more fish come in. Fish are still being hooked but just not everyone is hooking up. I’m keeping my fingers crossed on this fishery because we’ve had such incredible fishing there in the past few years. Dimitri’s guest with his catch – just over 30lbs! Bait, both herring and anchovies have been the prime lure. I run 2 and 2 and double up when I notice which they prefer that day. If on a good day you run out of bait try out some of your favorite patterns of spoons. I haven’t run out of bait yet but heard some guys on the radio had some success with the Cop Car. Other similar patterns should work. There’s also more cohos being caught so white hoochies would also be a good bet. Depths can be from 90′ and up higher to 30′ to also target the cohos. 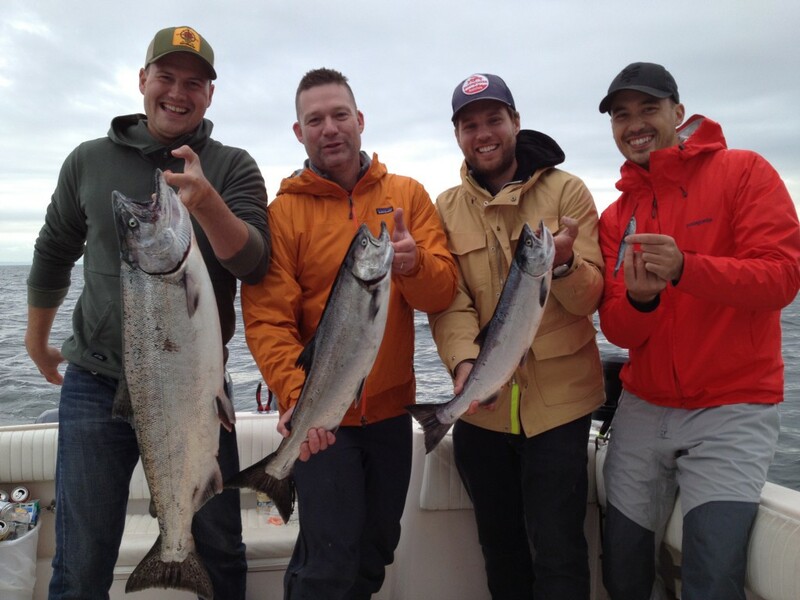 My best range has been between the 70′ to 50′ range except for when fishing the Capilano and hugging the bottom. Good teaser heads are the Spackle back in the light and Dark versions, Glo green, Bloody Nose, Purple Haze, UV clear and Clear green. I like to run a mix of the opaque and clear patterns and let the fish tell me which they prefer. In terms of flashers I’ve seen a wide array of patterns been used successfully. It’s always a good idea to mix and match and that’s how you find the combos that the fish really like!